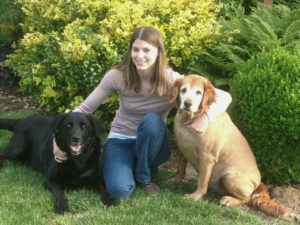 This crew of dog lovers will do everything we can to ensure your dog is safe and comfortable while in our care. I am happy to be the owner/operator of InBark, and I feel very fortunate to have such an awesome staff! I opened InBark six years ago, after leaving a 20 year career in the corporate world. And what a six years it has been! I love dogs and their enthusiasm for life and their loving natures, and I can’t think of a better career than working with them. I feel very blessed to have the opportunity to work with so many wonderful dogs and their equally wonderful owners. I grew up in Florida, but fell in love with the Pacific Northwest and here I am with my son Dylan, and our dogs Maxx, Aramis, Ember, and Rikki. I have an MBA from Penn State – love my Nittany Lions! 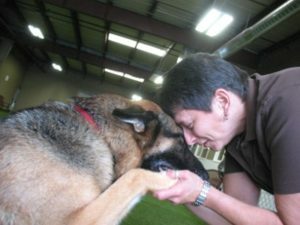 While working in the dog world I have had the opportunity to learn about so many amazing dog activities, including Nose Work. I now teach classes while working on my certification, and I compete in the sport with Maxx, Aramis, Ember. Meet our Manager, Destiny! Destiny grew up on a horse farm in Hubbard and has spent time training horses. She is also a certified veterinary assistant. She has a three year old son and two dogs, Tyson and Macie. She enjoys spending her free time with her family, camping, and hiking. 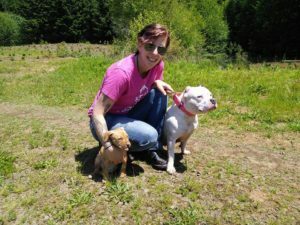 She’s great with dogs and people alike, and really enjoys getting to play with all of our four-legged guests!